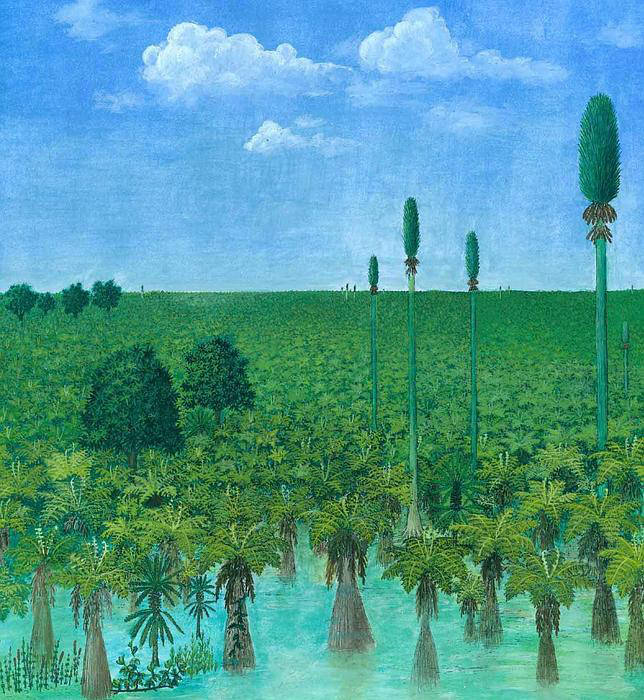 Recent studies of multiple intact fossilized forests provide a very detailed account of the presence of an seemingly alien forest that was found multiple locations across the entire globe at some point in the past. A forest completely devoid of the presence of any flowering plants such as oaks, maples and beech trees or even conifers such as firs, oaks, hemlocks or cedars. The contrast between modern geology and young-earth flood geology explanations of these fossil forests could not be more striking than in the case of the “Permian Pompeii” fossilized forests found in China. The former sees this forest as a real community of plants growing in space and time that was preserved in volcanic ash, while the latter imagines these plants, and the coal seams they are found between, as collections of plants caught up in the middle of a global flood that laid them down to form layers of rock including the coal and ash layers over a short period of time (days to weeks). 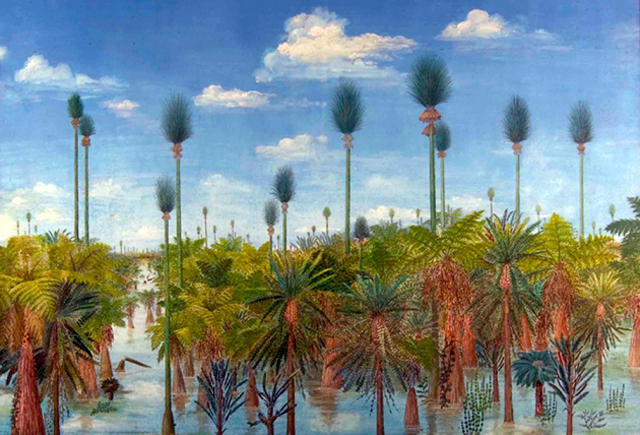 When I saw this picture (above) of a reconstructed forest from the fossil record and I read a highlight of recently published research describing it I asked myself, what does the typical evangelical Christian who has been brought up in a church culture espousing young earth creationism as the scientific response to secular science think when they read stories and see pictures such as the picture above? First, I believe that few Christians will be confronted with these stories because they won’t be looking in places where they are apt to find them. Most likely if they hear about these research results it will be in the form of news highlights that have passed through the filter of young earth magazines that will distill the stories into small sound bites and then provide an appraisal from a young earth worldview. Second, I expect that many Christians will read stories similar to my prior posts about fossilized elephant footprints or meteorite craters but will not even realize how much of a challenge they present to their young earth worldview. A third group of Christians will recognize the “danger” of these stories but assume that the reports are in error due to the bias of the investigators and so no further thought will be taken over the apparent conflict between the data and their young earth view. Lastly, a very small number of people will find the stories genuinely troubling and may seek to investigate them further but most likely will allow them to linger in the back of their minds until enough of these contradictions with their worldview reach a critical mass causing a reassessment of what they believe which may result in a crisis of faith. If you are predisposed to a young-earth worldview and you make it to the bottom of page them you certainly cannot be counted in the first category above. However, you should be warned that contemplation of the evidence presented below could make you uncomfortable as it will challenge your preconceived notions about the explanatory power of global flood geology. The study site, located near Wuda, China, is unique as it gives a snapshot of a moment in time. Because volcanic ash covered a large expanse of forest in the course of only a few days, the plants were preserved as they fell, in many cases in the exact locations where they grew. The researchers also found some smaller trees with leaves, branches, trunk and cones intact, preserved in their entirety. Due to nearby coal-mining activities unearthing large tracts of rock, the size of the researchers’ study plots is also unusual. They were able to examine a total of 1,000 m2 of the ash layer in three different sites located near one another, an area considered large enough to meaningfully characterize the local paleoecology. Stratigraphic Section showing two coal seams (black) which are separated by more than a 1/2 meter thick volcanic tuff. Figure from Pfefferkorn and Wang (reference below). The fossil forest of interest here is Flora 2. There are other preserved fossil floras above and below the coal seams but they are not as well preserved as the one in the thick ash layer (section with the little “v”s). The thin white lines represent the position of other much small ash falls in the coal seams. 1) The fossilized forest referred to above was found preserved in a 66 cm layer of tephra (volcanic ash) which is characteristically deposited as air born ash fall. The original ash fall was probably at least 100 cm (about 3 feet) but was compacted by material that eventually accumulated above the ash. Volcanic ash has the ability to provide exception preservation of material. The scientists crushed up 1000 square meters of this ash layer and with great effort counted and measured every plant fossil found in it along with the exact location. 2) The ash layer lies between two thick layers of coal (the reason that the Chinese were digging in this area to begin with and exposed this fascinating ash layer). See the figure, to the right, of the stratigraphic profile showing the position and thickness of the coal layers. 3) The ash layer contains the remains of entire plants most of them in presumably the exact positions they were in when the ash fell on them. Leaves and branches would have fallen to the ground in the forest and so many tree trunks are lying horizontal in the ash but many stems are preserved in upright position and the bases of the trees are preserved rooted in the coal seam below. 4) There are representatives of six types of plants at this location. There are multiple species of some groups but the overall diversity of plants is very low compared to typical plant communities today. 5) The groups of plants are completely different than any plants alive today! This is the feature that should be most striking, and possibly disturbing, to anyone that looks at the reconstruction pictures (see above and below). There is a type of tree-fern that is similar to tree-ferns found in the tropics today but they are definitely not the same species or even same genera as those alive today. Similarly there a few types of cycads which are simple form of conifer and have similar living “relatives’ today. Most plants in this forest are members of groups of plants (eg. Seed ferns and lycopods) that are ONLY found in the fossil record and typically are only found in very deep/old layers of the fossil record. 6) Related to #5 above but deserving its own point: there are NO flowering plants in this forest. There are also no pines, no cyprus, or spruce trees. There are no cattails and no aquatic flowering plants such as water lilies. There isn’t even any pollen of flowering plants present and pollen is the usually the most easily preserved part of a plant especially in volcanic ash so we can be quite certain that there were NO flowering plants here or even in the area around this site when this ash was deposited. Simply put the forest that is preserved in this volcanic ash is like no other forest anywhere on earth today! Look at the two reconstructions of the forest plants. These trees are strange but their appearance has been well described in the fossil literature from many other locations and there is a high degree of confidence in the general appearance of these trees, especially the very tall (>40 feet) trees? with the fuzzy tops. You might ask, but couldn’t this just be an isolated pocket of strange plants that were preserved? No, because the same groups of odd plants have been described in fossilized forests captured in volcanic ash or sediments above coal seams on nearly every continent. Similar extensive studies that have described every single preserved tree over acres of land have been conducted in eastern Europe, Canada and in Illinois, Pennsylvania and Indiana. These all have demonstrated the presence of similar groups of plants in a community to the exclusion of any flowering plants and they have been found in rocks dated to similar ages (300 million years) as those in China. 1) Try to imagine a specific series of events that could lead to such an odd collection of plants being preserved globally in the same “aged” rock at multiple locations all around the world. 2) How might a 66 cm layer of volcanic ash be deposited between two layers of compressed plants (coal) in the middle of a violent world wide flood? 3) Why are there be no apparent flowering plants, no reptiles, no mammals and no birds preserved in rock that preserves vast quantities of highly detailed plants in life like habit? 4) If all coal from the so-called Carboniferous period and which account for a large portion of all coal on earth is composed solely of these types of plants (ie. ferns and lycopods and NO flowering plants), shouldn’t that effect how a young earth creationists should think about what the pre-Flood world looked like? Figure 2 from Wang et al. PNAS 2012 (see reference citation below). This is the spatial data for the peat-forming swamp forest buried in vocanic ash. The types of trees are color coding allowing visualiazation of the spatial distribution of plants. Notice that the three sites each had different patterns of plants. B is the reconstruction of what the trees may have looked like along with their spatial patterning. Wang, J., Hermann W Pfefferkorn, Y. Zhang, and Z. Feng. 2012. Permian vegetational Pompeii from Inner Mongolia and its implications for landscape paleoecology and paleobiography of Cathaysia. PNAS 1115076109. Early Edition. Dimichele, W. and H. J. Falcon-Lang. 2011. Pennsylvanian “fossil forests” in growth position (Time zero assemblages): origin, taphonomic bias and palaeocological insights. J. Geological Society. 168: 585-605. Pfefferkorn, H and J. Wang. 2007. Early Permian coal-forming floras preserved as compression from the Wuda District (Inner Mongolia, China). The YDB Event: The Most Recent Global Catastrophe in Human History?